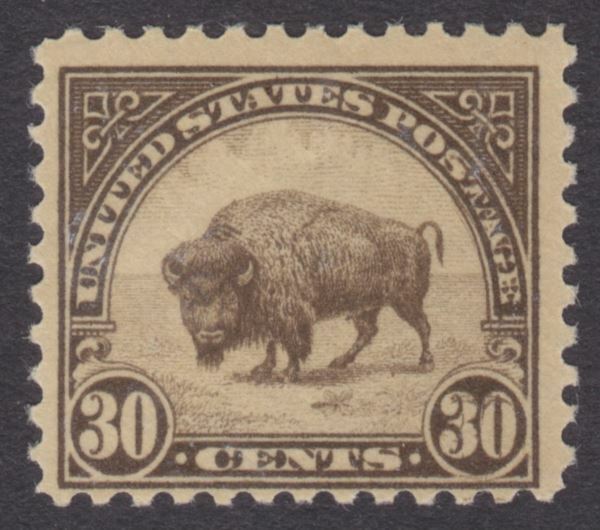 This past Sunday, I spent a couple of hours at the Texas Stamp Dealers Association's San Antonio Stamp Show, and stumbled across this interesting variety of the 30¢ Bison stamp from the Fourth Bureau issue (Scott 569) in a dealer's stock book. As you can see, this is a rather eye-catching example of a double transfer. It's most noticeable in the right-hand "30" and in the "STAGE" of "POSTAGE." This is one that's worth keeping an eye open for. The Scott Specialized Catalogue values the double transfer at roughly 10 times the price of a normal stamp, and unlike a lot of plate flaws, this is one that's pretty obvious even to the naked eye. Nice find! I think it's getting close to 10 years since I last went to the San Antonio TSDA show. I attended fairly regularly for several years as the show schedule matched my travel schedule almost perfectly smiley-face-whistle-2 A lot of the old-time dealers from back then are already gone or hobbled, but after reading your blog, it was nice to see some new show dealer names pop up in the past 10 years. I've on a rare occasion seen this double transfer on Ebay, but not recognized for what it is, obtain 2 or 3 real cheap. If any member wants this double transfer, go search Ebay for this one. Its rare to find one not recognized, but I've done it a few times, you can also find one, just keep trying! Dealer pages is another gold mine for this double transfer! Your block of 4 looks just like the block of 4 from the website "Re-Entries.com, under U.S.A. Re-Entries (double transfer). Wonder how often this happens? She did not say it was hers; she did "borrow" the pic to show us what the double transfer looks like since the pic in the OP is currently no longer viewable. I will try to edit the OP to update Kevin's link to his website. Meanwhile, the pic of the single that Lorna showed, is in fact the pic of Kevin's stamp. On modern stamps, it can difficult to distinguish between stamps, because the printing/die-cut is much more precise and consistent. On the older stamps, unless the stamp has been altered, you can almost always see differences if you examine it closely (even a pic). If there aren't differences in the print quality, there are almost certainly differences in the perforation position/edges. Stamps like the inverted Jenny, are so well documented, that you can ID the exact position of the stamp on the pane for more than 80 of the stamps just from a pic. 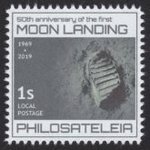 Indeed, there are a group of diligent collectors who peruse eBay to identify altered stamps by comparing unique aspects of the stamp to pics of matched original/unaltered stamp previously sold elsewhere. Most alterers are only interested in covering up or changing a specific area of the damaged or canceled stamp -- enough to fool the beginning/intermediate collector/shopper. So tell-tale perforation nibs, perforation hole anomalies can be matched, inking/print weaknesses... can be spotted/matched. khj: thank you for fixing the stamp image. I moved to a new Web server about a year ago and as you saw, a few things changed. doubletransfer: although eBay is not without its faults, there certainly are some nice finds on there from time to time. I've picked up several examples of my favorite stamp (the 14¢ American Indian) showing various plate flaws very inexpensively. The trick is finding listings with sufficiently large scans to know what you're looking at! I learned years ago, when searching for plate varieties one has to become familiar with the designs of issues or series you are looking for. Beside Ebay, another excellent resource is dealers stock books. Another place to find really good discoveries is in foreign countries. I've made a few really nice discoveries when I lived in Europe. Asia and Middle East is not a great place to find U.S. Material. You mentioned you favor the 14 Cent American Indian, I assume you are referring to the Scott Illustration number A168. I had a friend who wrote a book on Plate Varieties, unless you already have this book, suggest you pick up on, it should be easy to find. I Cloudy gave me a few, but I've already given away the excess copies I had. The book "Encyclopedia of Plate Varieties on U.S. Bureau Printed Postage Stamps by Loran C. French" (Cloudy to me). Thank you khj, for clearing this up for me. With that post, it finally dawned on me who you were! I remember you from a couple other stamp forums. It didn't click right away, because you don't use the same userid on the other forums. I should have noticed it in your intro thread when you mentioned you retired from the Air Force. I don't post at the other stamp forums much anymore. Great to see you here, David! Yes, that's the stamp. And I did pick up a copy of that book a year or two ago--very interesting stuff. The relief breaks in the oval around the central vignette are the only varieties of the 14¢ stamp listed in that book that I've found; the other flaws I've run across aren't listed therein. Thanks for your reply, with all Flat Plate printing (and others), I don't think there is any reference book that can list all plate varieties that exist. I've often found other plate varieties than listed in Cloudy's book. Good show. One trick I use when searching Ebay (bet you already know about this trick), enlarge the stamp image, that way you can easily see more of the design.